Hello friends, Today I will share the best guide on how to send large files over the internet for free. You can send any size data from your PC/Laptop to anyone computer using these methods. You can even send large file online through a download link. Users can transfer file upto 100GB using these methods. Send as many files you want to send through the internet. From a time when 5 MB hard drives were more massive than its users, to pen drives with a storage capacity of more than 1 TB. The information exchange media has come to a long distance. Over the years file sizes have expanded more and more, yet a majority of the email services like Gmail and Yahoo have attachment limits to just a few megabytes. Luckily, there are still many ways you can share large files over the internet. You can send large files over the internet quickly. 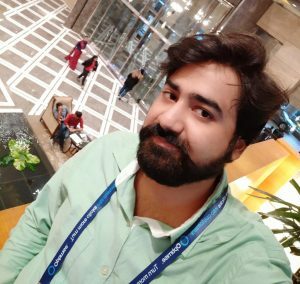 I have shared 5 different methods to send large data. You can use any of the ways depending on your requirements. Send unlimited large files without any hassle. Users can send file anyone around the world using this method. You can use a website to send large files over the internet. All these methods are free, and you can send as many files you wanted to send. Sometimes you may want to send only one file and don’t want to bother with making an account for that. In such cases, you can use file-sharing services. These services allow you to upload your file on their site so that the recipient can download it directly. There are numerous websites which let you share files through their server. But what makes WeTransfer our recommended option is its gigantic 2GB size limit per file. Also, there is no sign up required for uploading any file. 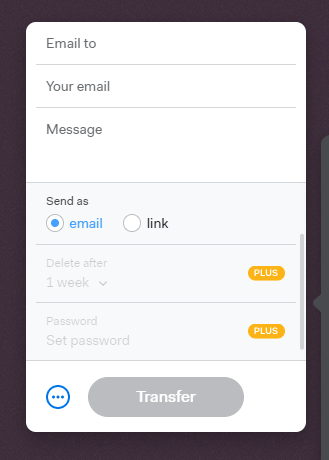 Go to Wetransfer and click on “I Agree” and “Skip” when presented with some prompts. Click on “Add your files” and select the file you want to upload. Note that these uploads will be available for download only for 7 days. Click on Option (three consecutive dots) button and choose whether you want to send the file as link or email. Enter the email ID of a recipient if you want to send the file via email. Otherwise, copy the link given to you and send it to the person who wants to download the file. WeTransfer also has its iOS app which allows sharing files up to 10GB for free without signing up. File sharing services are an excellent option for single-time use. But there are some drawbacks too. Since the file is uploaded directly from a browser, the upload can fail due in which case you’ll have to upload it again from scratch. Also, the files uploaded on these servers can be downloaded by anyone, so it’s not suitable for sharing confidential data. You can also share large files via email with cloud storage services like Google Drive or Dropbox. These services offer large size limits and allow recipients to download them without any hassle. We recommend using Google Drive as it’s available on a majority of platforms and has a pretty simple user interface. It gives users 25GB of free storage for uploading all kind of files. You can also get additional 100GB of space for a limited time on a purchase of a selected range of smartphones. There is also no limit on the size of file uploaded as long as you have enough free space in your drive. Open Google Drive and login to your account. Tap on the “New” button on the top left corner of the screen. Now select the file which you want to share. Click on Get Shareable Link (chain) button. It will copy the shareable link which will allow anyone to access this file through it. Send the shareable link to a recipient and ask him to visit it for downloading the file concerned. You can increase the free space available to up to 1TB by subscribing to the premium plans of Google Drive. We mentioned earlier that email attachments are limited to 25MB in most cases. However, there is still one way to share larger files directly with an email. Most popular email services have cloud service integration which allows you to send large files over the Internet in your cloud from email. Follow the steps given below to share large files directly via Gmail. First of all, make sure you are using the regular version of Gmail and not the HTML version. Click on “Compose” button to create a new message. Enter the email address of recipient and Subject and Body, if any. 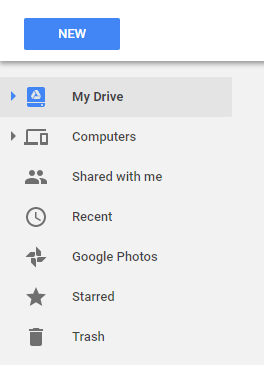 Now click on the Google Drive option located beside Attachment option. It will redirect you to your Google Drive account. Select the file or folder you want to upload. You can choose whether you want to insert the selected file as a link or as an attachment. Note that the attachment limit of 25MB will not be applicable. You can upload your data to Social Media. There are several social media websites where you can upload your data, and your friends can view that data online. It is the best way to share large files using Social Media. File Transfer Protocol (FTP) is a server which is used for transferring files from one device to another using web server. The interface of an FTP client looks like that of a File Manager and allows you to copy, upload, and download files. Firstly, download the File Transfer Protocol client on your computer. Run the FileZilla installation file by following the instructions given. Open FileZilla FTP Client. Since FTP is used to share files with a web server, you need to have a website for using this method. You can create a free website with BlogSpot or WordPress. Click on “New Site” option and enter the required information in the “General” section. It will include your username and password for FTP server. On the left side of your screen, you’ll see a list of files saved on your current device. On the right side, there’ll be a list of files uploaded to the web server. These are the best methods to send large files over the internet. You can select any way to send large data files directly to anyone PC/Laptops. Please tell us which method you will use to send data over the internet. You can also share your best and secure process to send large files over the internet in the comments section below. And don’t forget to share this article with your friends.